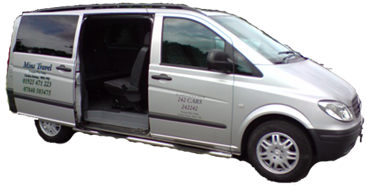 Welcome to Mint Travel, your local Private Hire Minibus firm for all occasions. Hire our 7 Seater Mini Bus with Karaoke & DVD Entertainment for any occasion, keep the kids entertained on the way to the Airport or have a sing song whilst travelling to your Night Out Destination to Warrington, Manchester, Liverpool, Wigan, St Helens, Chester and many more. Mint Travel specialise is Airport Transfers which covers all UK Airports with special offers from £26 for 4 people, £30 for 5 people and £33.50 for 7 people (one way) to Manchester and Liverpool John Lennon Airports from Warrington. Offering special rates for nights out to Liverpool and Manchester with the Karaoke Bus why not travel in style and get the party started with Mint Travel. We also have various Cars for short journeys so look no further than Mint Travel for all your Taxi and Transfer needs.